We no longer just head to the sunshine during six weeks in summer—one quick scroll on Instagram confirms that plenty of people are turning on their out-of-offices every single month of the year. To reflect our new constant state of holiday envy, we’re introducing The Suitcase Diaries, a series in which we (virtually) hop inside the luggage of some of the most stylish women we know and let them be our tour guides. 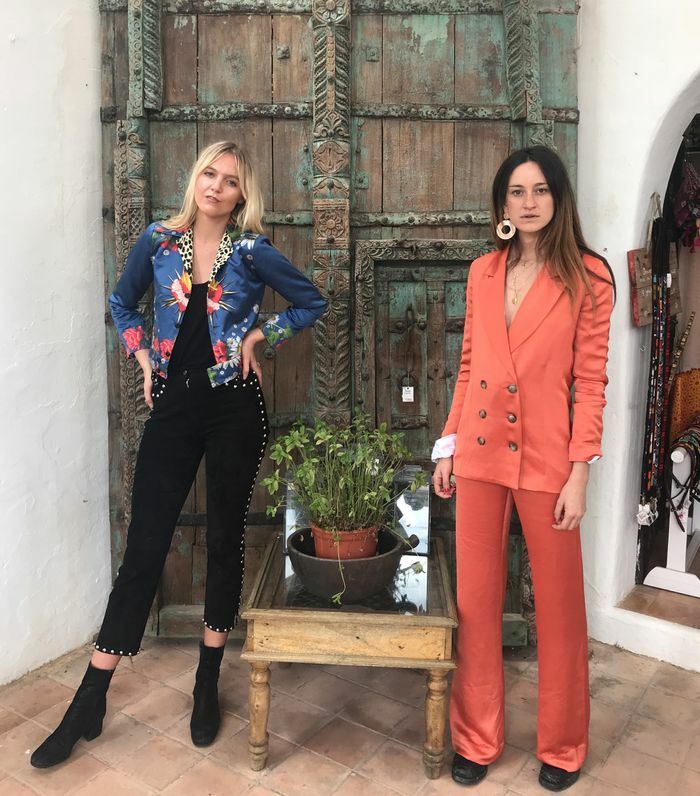 When looking for an Ibiza tour guide, you won't find much better than the founders of Ibizan label De La Vali, Jana Sascha and Laura Castro. Their playful flamenco-esque dresses and vibrant prints are all inspired by the island, and so who better to show you how to pack for a trip to the White Isle? Keep scrolling for their guide to how to dress and make the most of 24 hours in Ibiza. Outside Galleria Elefante wearing Valentine jacket and Uma Suit. "At this time of year in Ibiza, it's important to pack for any occasion, as you'll probably have lots of sunshine, but the nights can get quite chilly," they say. "We always bring a section of small jackets (like our Valentine, Uma blazer, or our all-time-favourite cropped studded Billy Ray jackets). Shoe-wise, we always bring good boots and a pair of traditional Spanish espadrilles, as they're so easy to combine with every look. "We love packing our signature De La Vali dresses, as they're light to carry and the perfect thing to wear in Ibiza. Our current favourites are the Juliette, a long silk dress, and the Suki minidress. We were brought up on the island, so when designing our collections we always keep Ibiza in mind. We aspire to create the perfect beach-to-bar looks, which are cool, elegant and fun." In Nobu Hotel wearing Juliette Pola and Olivia Magnolia. "A great place to stay is Nobu Hotel; it's close to town and easy to get to, and it has the most impressive pool overlooking the sea, along with the most delicious cocktails and food. Nobu actually has a really cool little boutique that stocks our collections too!" Our magical spot, Es Vedra. "We love our secret spots, such as the magical Es Verda," they add. "The view is like nothing you've ever seen—the perfect place to capture the sunset! It's the third most magnetic point in the world and has a really special energy. Our favourite shopping spot is a small vintage boutique in town called Vicente Ganesh. The owner has the most amazing selection of vintage treasures—we love a vintage hunt. "Annie's is also a great little shop owned by a good friend of ours—it's one of our stockists on the island! It's situated right in the heart of the Old Town, which is a stunning part of Ibiza. Another absolute favourite is Galeria Elefante. It's a beautiful lifestyle boutique on the road to Santa Gertrudis, and it sells everything from jewellery to furniture. It has so much charm and character, and is the dream shop for buying presents." Outside Vicente Ganesh Vinatge boutique in Ibiza town. Anyone else suddenly craving an Ibiza break?